Cut any of the older Diehards or Tango and Cash or Lethal Weapon or any successful “odd couple” movie in half with regard to quality and that is about where Walter Hill’s Bullet to the Head comes in at. Being that we are done with 2012, I had high hopes for this one, but the big hitters aren’t always the ones to come last. Stallone is “James Bonomo,” a hardened criminal with a record a mile long. After his partner “Louis” (Jon Seda) is taken out, he crosses paths with a detective, “Taylor Kwon” (Sung Kang). Kwon wants to solve a murder, but Bonomo wants revenge. Kwon is law-abiding; Bonomo is vigilante king; principally opposing and not really trusting each other at any step in working together, they agree to press on once Kwon realizes that corruption runs deep within the police force. From there, he is forced to trust the guy he wishes he didn’t have to trust. Their search leads them to “Marcus Baptiste” (Christian Slater). 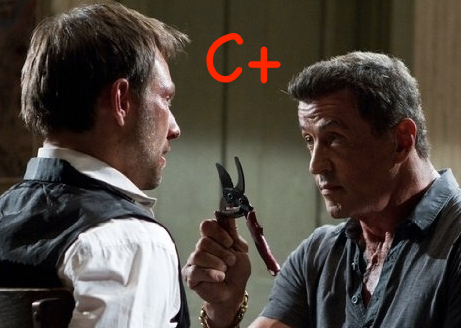 Thing about him is, unlike so many other “connected” individuals who at first refuse to talk, he knows that when faced with a Stallone with a pair of pliers in hand, it is best not to try his patience. After Baptiste, we meet our main villain (and probably the most forgettable in many, many years of movies), “Robert Nkomo Morel” (Adewale Akinnuoye-Agbaje), an African crime-lord who has escaped to the USA. Morel has no personality and only thinks about and values money (he says so in just about so many words). His goal: To tear down a community and replace it with a condominium for the rich! Oh, how novel! That and many other clichés are just a part of everyday life in Bullet to the Head-world. The movie is dark, rather slummy, and feels just like something Stallone would star in back in the 1970s or 80s. You almost want to take a shower after watching. At close to 70 years old, Stallone looks damn good. He’s built like some sentinel that can manhandle the lesser strong men in a sci-fi TV show. He’s tattooed, and honestly, looks way younger than he is. What doesn’t feel young is the movie. There is even a battle in a warehouse to top off your cliché expectations. But in a world of corrupt congressmen and paid-off cops with no morals at all, we just can’t expect much. The script, no, it isn’t that smart, and indeed couldn’t be or there’d be no room for Bonomo and his verbal Asian jabs or Kwon’s “technologically challenged old man” jabs back. It’s silly stuff. It’s for cinematic simpletons. 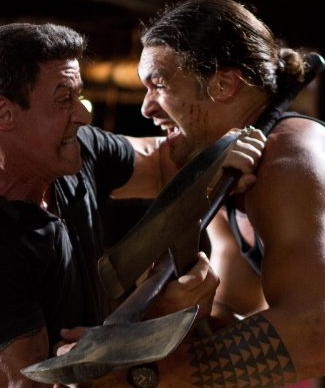 The physical takedowns tend to be impressive and struggles end up on the ground (like they do in real life), but as is usual in movie-land and here, when people are knocked out, they are out for a long time and yet don’t sustain brain damage (which they would). And when someone gets shot and can’t go to the hospital, they find a makeshift doc who can clean things with whiskey and sort of “patch up” the one who needs it. That doc here is “Lisa” (Sarah Shahi), Bonomo’s smoking hot daughter. The plot is a little confusing and a lot on the forgettable side. We are supposed to derive something from the principles of both good guy and bad guy being challenged; sometimes the bad guy has to work with the good cop and sometimes the good cop has to count on the bad guy. The problem is, the premise isn’t that big of a sell. And we’re past that, anyway.